Today was a hard day… being behind because of Friday’s insanity plus leaving work for an appointment mid-day meant I had to be on the ball. I accomplished what I wanted to before leaving tonight. Here is a glimpse of what I had in my arsenal today. In this photo: my assortment of work-issued highlighters, tons of paperwork (lots of past issues for reference), my printed google spreadsheet to guide me through my battle, my circa/rolla compact planner, a Sanford Liquid Expresso in blue, a blue UniBall Signo 207 micro and a Bic permanent marker. Someone on DIYPlanner posted about Post-It addictions. I have sticky notes coming out of my ears. But these have to be some of my favorites. I love using them at work since they are humorous. I picked them up on clearance at Office Max. Click to see a larger version and read some the options. I have a square and circle pad of busy multi colored ones from a friend and the traditional yellow (work-issued). Today’s pens were premeditated. I wanted to bring the Liquid Expresso on Friday but couldn’t find it easily. I was prepared this morning. The 207 spawned from the review over at Mind Most Peculiar I almost bought a 2 pack of the pink 0.7mm version yesterday while perusing Office Depot but stayed strong and resisted. 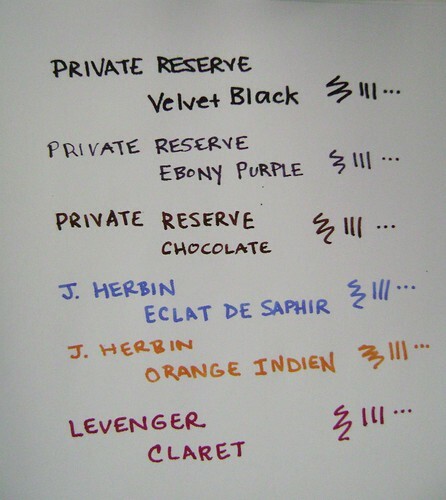 The Liquid Expresso is easy to write with and the color is bold and powerful. I don’t have to press at all to leave a nice dark mark and that helps me thwart any wrist complications in my daily adventures. The Signo is equally reliable. I can count a fine but smooth line that doesn’t take any pressure to leave. I mainly used the Signo 207 in my planner to record personal notes and reminders, my times in and out at work and stuff at the Vet’s office I wasn’t going to recall because of emotions running high. I would say the Liquid express writes like an average bold gel pen tip or the Paper Mate Flair. Its definitely not a fine line but I like the control. I don’t feel that it is TOO wide or unruly. The lines on my Google spreadsheets are not very large and I can fit a lot of info into a small space when needed. The Signo 207 Micro writes smaller than the average 0.5mm in my opinion. The smooth and non-scratchy gel ink and small tip has really boosted this pens popularity. I hope to try the 0.7mm someday soon. 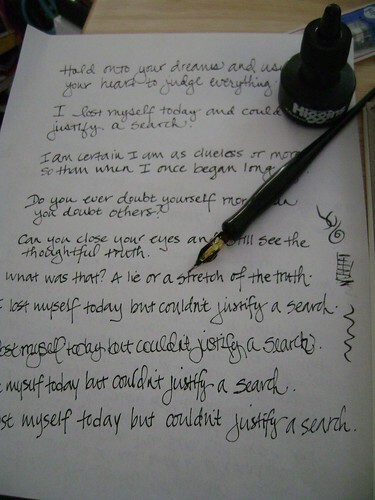 Both pens offer visible ink supply. The Liquid Expresso sports a durable, porous plastic point. I can’t comment on durability because I hardly press down with it. If you use it the same you can expect it to hold up well. As stated earlier, the 207 is a gel pen and unlike the Expresso, it is retractable. This feature is nice for those of us who misplace caps. The Expresso cap does fit snugly on the end so no losses are likely. The 207 is refillable which is a nice “green” feature. Both pens are available in other colors and tip sizes. That’s all for today’s arsenal. Tomorrow is deadline day… what will my future hold – fushia or pink? A nice bold, attention commanding line that demands respect? or a small fine micro line that boast control and that ‘in-charge’ attitude? Guess we’ll have to wait and see. When you wake up in the morning and start your day, do you grab a special pen or marker to accompany you? Yuh I am **that** wierd! 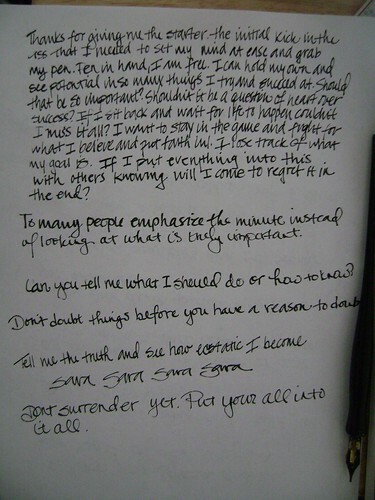 I have discovered that I am not alone in my infatuation with all things pen and paper related. 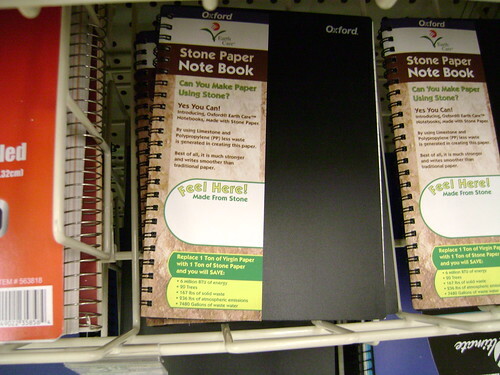 Many folks over at DIYPlanner share in the love of paper – notebooks, journals, planner pages, hardbound, spiral bound, disc bound, etc.etc.etc. Would you like to hear a story? Of course you would, right? 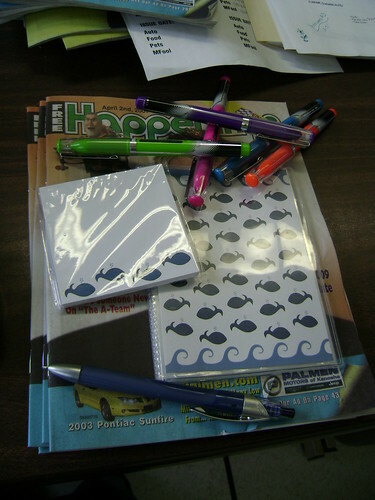 When I was growing up, I often used my saved money to purchase pens and notebooks rather than other goodies. Candy is great but it doesn’t last a long time. A good pen – or a new notebook to jot ideas in – now that is an investment. I can remember my father taking me to the office supply store and supporting my desire to try all the different pens and markers. I had a complete set of sharpie highlighters by the time I was in high school. Every color in the regular and pocket size. I had sharpie markers coming out of my ears. My pen drawer? My pen drawer was overflowing and often attracted the attention of my mother. She never really understood but I think she liked the fact that it was a safe addiction. Each person who values a good pen has certain aspects they require – smooth ink, effortless writing, thin or wide barrels, weights, lengths. Remember to keep this in mind as you explore the world of pen reviews. 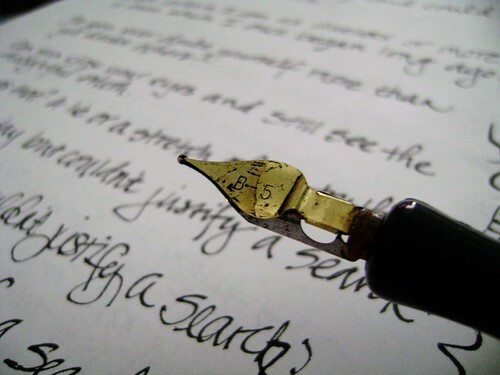 You may think a certain pen is the bee’s knees while another hates it with a passion and banishes it to the dreaded “loaner” line. Now on to My Daily Arsenal. 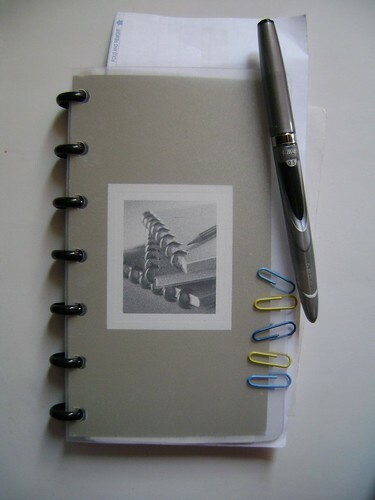 Have you ever glanced around and seen someone using a pen or notebook and were to shy or embarrassed to ask about it? Lets say I have developed the odd hobby of exploring the internet looking at what other people are writing or drawing with and in. I also like seeing work spaces and office paraphernalia. This will be your chance to see what I am out in the world utilizing on a given day. Let’s give this a go, shall we? Click to see notes on Flickr. The BIC pen was a good choice today. I do a lot of quick writing at my job and gel ink really treats me the best. I have tendinitis in both wrists and I get writing fatigue quickly if I’m not careful. Gel ink is effortless when its done right. BIC has been a fall-back brand for me. I can always rely on their pens to last a long time and I rarely run into a dud. The neon Magna Blast pens in pink, orange, green, blue and purple are my splash of sanity. Color is so important to me. I don’t have walls of my own to decorate (I have taken over the circuit breaker box though). I often mark things with neon when I don’t feel like highlighting. I mark dates of editorial copy I have used in different issues or the movie times as I enter them for the 6 cinemas we include in our publications. I’ll even drop a post-it note to a co worker in a bright color. Blue and Black are great and reliable but … lets face it. Color makes our days unique and really helps something pop in a see of paperwork. The cutie whale deco stuff just sat on the sidelines and mocked me… I have ideas and I will get to them. Today was just not the day to do it… so stay tuned. This disaster zone is to the left of my keyboard. I have my snacks because I never know when I can escape for lunch. I also had a kidney stone in 2004 so water is ALWAYS within arms reach. I even have been known to preach about the importance of staying well hydrated. Have you had all your cups of water today? The compact sized circa/rollabind planner is my life. I have all my personal goodies in this book and have found I really cannot function efficiently or effectively without it. I plan on blogging more about it very soon and have some photos in my Flickr pool if you can’t wait. I have a BIC Triumph 730R clipped to the cover. I love having a pen right with it so I can punch in and out at work and record the times inside. This really has helped me keep a handle on my work schedule. There you have a peak into my arsenal from today. I will try to snap some writing samples next time if time will allow. Today was just busy-busy with the deadline tomorrow. Please feel free to leave your thoughts or just a random comment. I know, everyone does, right? 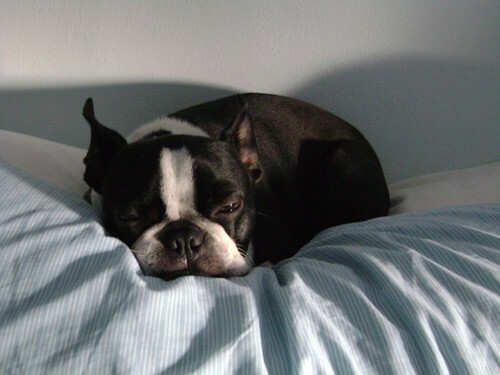 ♥ Links to some great blogs I have enjoyed… how could I live without these for so long? I really want to be a more active blogger and share what creative things are apart of my life. WIP (works in progress) will probably become a regular topic since I can’t keep my crochet hooks still. I have a crazy desire to learn how to do more than just knit (like perling and really knitting something). I want to extend a thank you to everyone who has stopped by this blog. It means a lot to me that there are people interested in what I am doing :o) Take care, be well. Feel free to download it and use it but remember it is mine and should be respected as such. I am attempting to restart my creative side… this is the first page I have created in some time. Keep you eyes open for additional forms and dabblings in digital creativity. 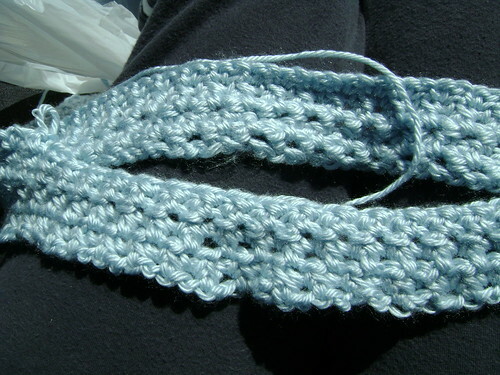 I am still crocheting and reading regularly – I think that has really kept my brain working on future projects. It isn’t complex and best of all… it is working – When I stick with it. 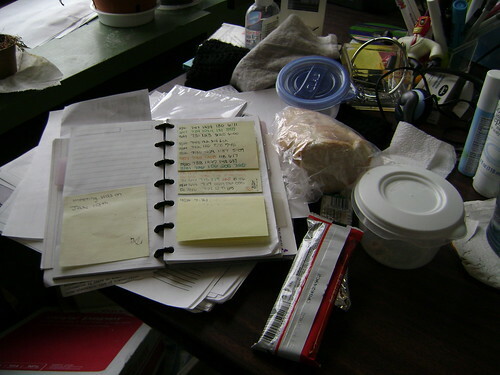 My at home organizing quest is in progress, albeit moving slowly because of balancing work and an outside life. (lets say work often takes all my stamina). Currently I am circa punching all my important papers and adding them to one set of covers. I have jumbo discs at hand if needed but right now am only on large ones. I want to invest in good quality covers and dividers at some point but right now it is just an attempt to tame the plethora of paper piles I have inadvertently accumulated over the past months. Oh and I should mention – I have left my crochet comfort zone! 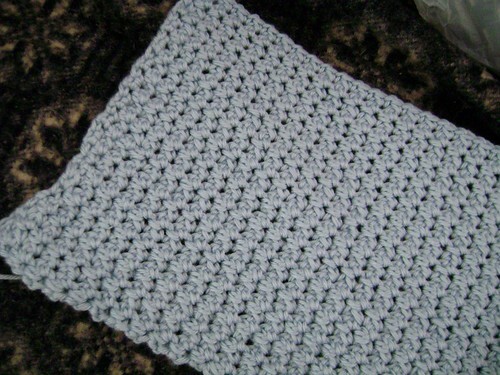 I am attempting a full size blanket :D Stay tuned for pictures… its not very blanket-like yet but it is growing. So… Here is an update on my quest for organization. Introducing the DIY circa/rolla hPDA Dock! I love having the portability of the hPDA by itself. Its small and easy to bring along with me at all times. However, when its time to process the inbox or I have the ability to bring along my larger planner – it felt awkward having the two separate entities. 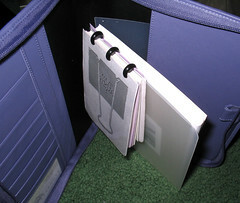 Often the little hPDA would slip off my stack and fall into that dark dirty area between the car seat and the door. (You know that horrible place that claims your most prized possessions.) This idea stemmed from my success with the DIY 2-in-1 Combo Rolla/Circa Notebook and the need to keep these two necessities together. There are two options. 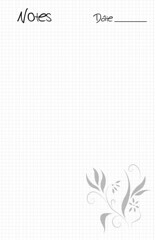 You can either opt to create a cover for your main planner that extends roughly a half an inch above the normal edge of your planner. I chose the other option since I am still playing around with which setup I like most. 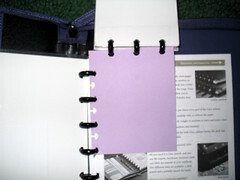 I created a card stock insert that extends above the top of the planner just under a half an inch. It is smurfed on the side (where it snaps into the main planner) and the top (where the hPDA “docks”). This picture shows two sets of smurfs (the rolla/circa punch shapes). 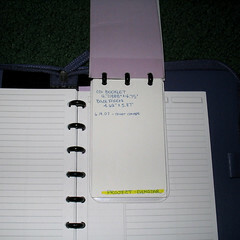 This allows me to use the same insert for both my junior size planner and my quarter sheet size notebook. If you utilize one main planner – you will probably only need one set of smurfs. Placing the insert further back in the planner will allow you to utilize both notebooks simultaneously – which is great for GTD reviews and clearing your Inbox/Brain Dump. It may be necessary to reinforce your insert. I use clear packing tape because I am DIYSara but you could splurge on actual lamination. The more durable the insert, the longer your DIY hPDA Dock of Greatness will be helping you GTD! Here is a picture of my current setup. I recently bought myself a birthday present – a Levenger Compact Zip Folio. 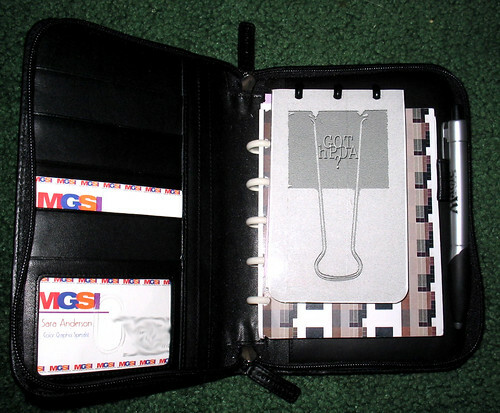 It currently holds my circa/rolla quarter page notebook with docked circa/rolla hPDA. I’m excited to see how this new setup works out in my quest for organizational zen.